Step 3. Hang the light on anywhere you want. SMALL & PORTABLE - LED solar lantern size:3.46"x3.46"x5.5", with a metal clamp and ring, easy to hang the lantern lights to anywhere you want. AUTO SENSOR - Slide the bottom switch to "AUTO",the patio umbrella solar lights will automatically charge itself during the day and light up at night. WEATHERPROOF IP44 - Solar umbrella lights weatherproof, suitable for outdoor use. Replaceable battery design let the outdoor hanging solar lantern lights provide longer service. WIDELY USED - Outdoor lantern lights with a cute clamp, very durable and powerful. Decorative lanterns can hung on umbrella, tent, tree and elsewhere, decorate your environment when you are partying, camping, fishing and so on. 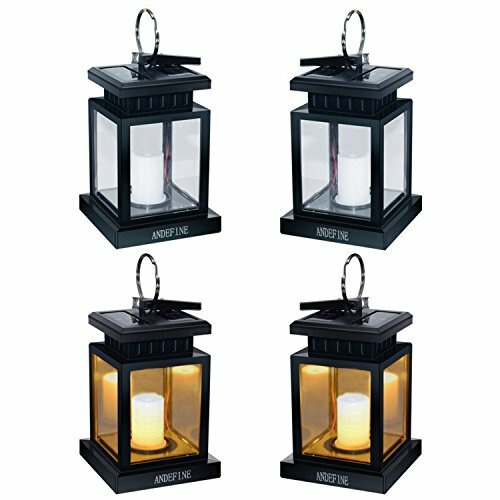 100% SATISFACTION GUARANTEE - ANDEFINE solar candle lantern with 12 months quality assurance service, any problem please message us and we will send you new hanging solar lights or refund you to make you satisfied. If you have any questions about this product by ANDEFINE, contact us by completing and submitting the form below. If you are looking for a specif part number, please include it with your message.